A West Belfast Down’s Syndrome support group says the booking of controversial comedian Frankie Boyle for the annual Féile an Phobail is “extremely disappointing”. The Andersonstown News revealed last week that Frankie Boyle is set to make his West Belfast debut at the Féile Big Top on August 7, headlining the hugely popular comedy night. Speaking to the Ander-sonstown News, the Secretary of the Glen Community Centre-based Stephen Hartley Down’s Syndrome Support Group says the booking does not reflect the ethos Féile an Phobail claims to promote. The Stephen Hartley Down’s Syndrome Support Group was set up to support those affected by Down’s Syndrome and their families seven years ago. 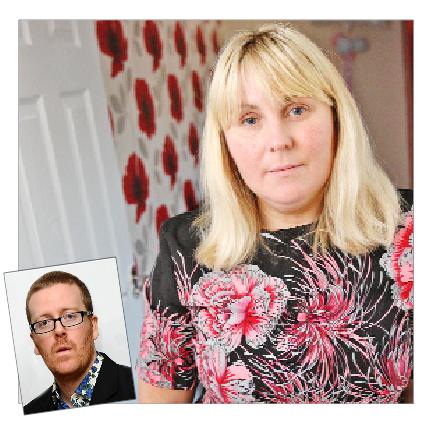 Back in 2010 Frankie Boyle was heavily criticised by the parents of a five-year-old girl with Down’s Syndrome after a sold-out gig in Reading. The caustic comedian also came under fire over a joke he made about glamour model Katie Price’s son Harvey during a taping of his stand-up TV show Tramadol Nights – Harvey Price is blind and severely autistic. Julie added: “I enjoy a laugh like everyone else and believe in the freedom of speech but this is a disappointing booking for the Festival. “It’s hard bringing up a child with disabilities and you want them to be included. For someone to stand up and make jokes about the way people with Down’s Syndrome speak, eat, dress themselves, their haircuts, their parents, I mean they are vulnerable and can’t stand up to challenge Frankie Boyle. “Is it in vogue now to make fun of the vulnerable to get a laugh? Is Frankie Boyle that unimaginative? “I love comedians like John Bishop, Peter Kay, they don’t need to go and make fun of the disabled, it’s a kind of bullying in my view,” she added. Julie said that she intends to write a letter of complaint to the Féile committee to voice the concerns of the support group. “For me, personally, I love Féile an Phobail and have attended so many events of theirs over years but if the booking goes ahead I will be bitterly disappointed. Josie Gibson’s brother-in-law, Emmanuel Gibson, has Down’s and Josie said Frankie Boyle “should not be celebrated at a community event like Féile”. “With his history of making fun of suicide and disability, does he really have a place at Féile?” she asked. “My brother-in-law has Down’s and lives a fulfilling life. He brings a lot of joy to our lives and he loves Féile. He lives right beside the Falls Park and now we must make sure he does not attend this year for fear he is insulted in his own area. No-one from Féile was available for comment at the time of going to press, but they have promised to issue a statement to the Andersons-town News on the matter next week. No-one from Frankie Boyle’s management company was available for comment.